comes to dancing, and most of it nowadays has been shelved. partake in contra dancing. And I am happy to say I will be back. people were happy to see me. 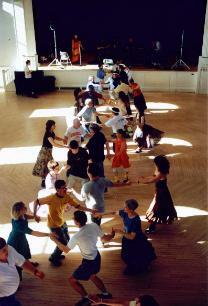 “allemande” and “spins” to meet and dance with other people along the way. thrived on French, French-Canadian, and traditional Yankee influences as well. their children now as well. cousin to contra, started to become more complex and specialized. with the musicians, who choose the music. dance in your area visit www.thedancegypsy.com. About the author: James Duffy of Keene, NH, is freelance writer and poet.